The Insurance Claim Submission Analysis report is an Advanced Report which displays the submitted claims within a date range. The report will show the amount charged as well as the balance due with the percentage remaining. Class — The insurance type on that claim, e.g. Commercial Insurance. ID — The insurance's Payer ID. Insurance — The insurance name. 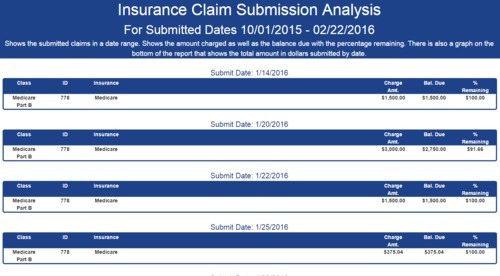 Charge Amount — Total amount of all claims sent to that insurance company on that date. Balance Due — The remaining amount due of all claims sent to that insurance company on that date.